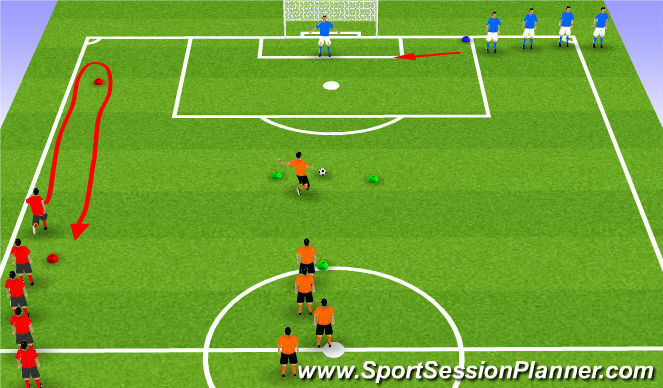 The idea of the game is to score as many goals as possible when it is your teams turn to shoot. each of the orange team will take it in turns to run and strike the ball at goal. Whether they score or miss it is their responsibility to get the ball back and place it on the line for the next person to shoot. The blue team will change who is in goal after every shot and must try to limit the number of goals that are scored. The red team are the human stopwatch. They must each complete 3 shuttle runs around the far red cone in the fastest possible time. The quicker they do this the less chance the strikers have of scoring well! swap the teams around after each stopwatch run is complete and the team who scored the most when acting as strikers are the winners!